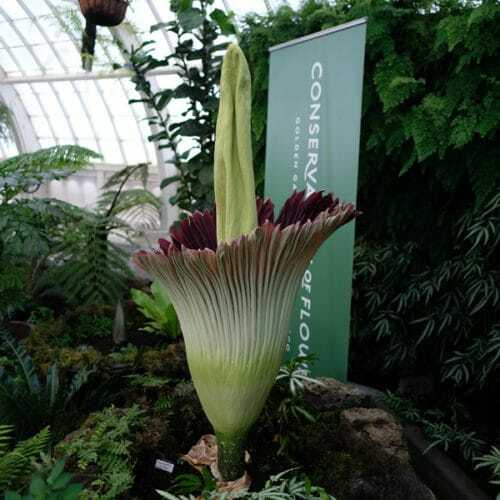 In Summer 2018, the Conservatory of Flowers experienced two Corpse Flower blooms, Suma the Titan and Amor the Arum. Read more about the blooming events below. Stay connected : Follow along on Instagram and Facebook. Or sign up to receive email updates here. On September 5, 2018, Amor the Arum bloomed at the Conservatory of Flowers. The Corpse Flower is actually an arrangement of hundreds of flowers, arranged at the bottom of the tall yellow spadix, protected by that beautiful cabernet-colored spathe. About half the flowers are female and half are male. The female flowers open on the first night, ready for beetle pollinators to bring pollen from visits to other Corpse Flowers. As we don’t have live beetles already dusted with Corpse Flower pollen, we appointed the next best thing: horticulturist Mario, a brush, and a vial of pollen. Where did we get this pollen? We worked with our compatriots down at The Huntington in Pasadena, who were kind enough to share fresh pollen from their recent Corpse Flower blooms. Before applying the pollen, Mario checked the viability of the female flowers by looking for stigmas that were yellow and slightly sticky. The flowers proved to be receptive, at which point Mario picked up the the pollen with a custom-made brush, gently reaching into the center of the bloom and applying it to the female flowers. Fingers crossed that this pollination event was successful! Stay tuned for future fruit developments. August 24, 2018: This Corpse Flower, Amorphophallus titanum, is currently unnamed and a sibling to Suma, the Corpse Flower that bloomed just one month ago. Our skilled horticulture staff have nurtured this plant into its first bloom at age 10 years. Suma’s bloom was an olfactory experience like no other- we are excited to offer our guests another opportunity to witness this bloom. Today’s height measurement is 45 inches. On July 22, 2018, Suma the Titan bloomed at the Conservatory of Flowers. The opening is captured in the time-lapse video below and in photos on Facebook and Instagram. July 27, 2018: Today is a bittersweet day, as Suma the Titan begins to senesce after putting on such a wonderful show for all of us. In photos taken around 9:30 am the spadix is still standing tall, however around 11:00 am our fantastic interpretive intern Brandon was lucky enough to observe the collapse of the spadix. “Is this really happening?” says Brandon of the suddenness of the collapse. The bloom of a Corpse Flower is such an ephemeral event. Suma the Titan opened as a bloom around 2:00 pm on Sunday July 22 and today, five days later, has begun to collapse. What’s next for Suma the Titan? This plant will be left in place for the moment. The horticulture staff will remove any deceased portions of the bloom and will ensure that the powerhouse of this species, the corm, is maintained in good health. July 24, 2018: Whew! What a whirlwind of a couple days. We’ve hosting thousands of excited visitors and Suma the Titan was there to welcome everyone. Our guests voted on what their olfactory experience was and the most popular choice was compost heap, followed by stinky cheese and smelly socks. Today we are at day three for this bloom, and while the olfactory impact is not as intense, the bloom is still a gorgeous sight to behold. July 22, 2018: Tonight’s the night. We are officially at Bloom O’Clock! Today around 2:00 pm we noticed that Suma the Titan has decided to make their debut to the world, in their stinkiest form. This fabulous inflorescence has begun to open, with the spathe pulling away from the spadix. Soon the Conservatory of Flowers will be enveloped with the sweet scent of rotting corpses, as Suma the Titan beckons all potential pollinators. Today, Sunday July 22, we will be open for extended hours, with the last entry at 9:30 pm. Monday, July 23, open hours will be 10:00 am – 10:00 pm. Please join us in celebrating this wonder of the natural world, Suma the Titan. July 21, 2018: Is it Bloom O’Clock yet? The folks at the Conservatory of Flowers have been waiting with bated breath for Suma the Titan to showcase their full spectacular self. It is slightly like waiting for a baby to arrive…will it be today? Color: the spathe is flushing even more with its lovely garnet color. Height: today it measured a full 56 inches, so it has grown a bit. Circumference at its widest: today it measured at 41.25 inches, its widest yet. It’s a foggy day here in Golden Gate Park so if you’re outside of the fog belt and feeling the need for love from Karl the fog, swing by the Conservatory of Flowers and check on Suma the Titan! Also, check out this beautiful flush of color. Things are looking nice here in the Conservatory of Flowers! This bloom is imminent. Typically it opens in the late afternoon, so the moment we observe it opening we will keep you updated. July 17, 2018: Suma the Titan is getting closer and closer to their moment to shine. Today the maroonish flush of color continues to develop on the spathe. Another cue we are keeping an eye on is the senescence and falling away of the protective bract, which can be seen in the first photo. This bloom is imminent within the next several days! Combine these chemical components at various stages and the deep aroma of rotting meat emanates from this plant. It’s a smell to behold and an opportunity that few people get to experience in person. The Conservatory of Flowers is absolutely thrilled to share this fantastic botanical experience with our community. Come visit us and experience this magical olfactory wonder for yourself! July 16, 2018: We are beginning to approach count-down time! Based on the cues this plant is giving us, we anticipate Suma the Titan is just days away from blooming (!!!!). As of the most recent measurement, we are at 49 inches in height and 35 inches in circumference. Keep your eyes on the live webcam to see the latest developments. Check out the strange structure we are measuring in the first photo…this misshapen phalic structure is how this genus received its name: Amorphophallus. In botanical terms, this structure is called the spadix and it is on the lower sections of the spadix where the many individual flowers develop. The spadix, together with the spathe, form what is called an inflorescence. While it looks like one giant Corpse Flower, in reality this plant produces this inflorescence that supports a large number of smaller, less showy flowers. A comparison would be a calla lily, which can be found in many California gardens. Starting today we are open for extended hours to give each and every one of you the opportunity to experience this botanical treat at the Conservatory of Flowers. Last tickets are sold at 9:30 pm. We hope to see you here at the Conservatory of Flowers in Golden Gate Park! July 14, 2018: It’s another foggy morning in Golden Gate Park and the sun is slightly pushing through. 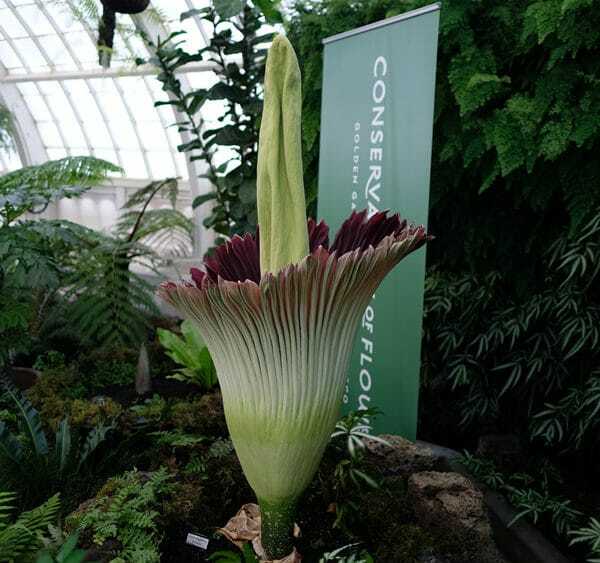 But inside the Conservatory of Flowers there are perfect growing conditions for our Corpse Flower, Suma the Titan. Today at 10:08 a.m. Suma the Titan was 46″ in height and 33.5″ in circumference. We also noticed that there is a slight color change to the inside of the spathe. Additionally, the outer bracts continue to pull away. What does this all mean? These are some of the slight changes in Suma the Titan that we look for and record to help give us a better understanding of the cycle of this bloom. Suma the Titan is known as Amorphophallus titanum in the botanical and horticultural worlds. There are over 80 species of Amorphophallus, some quite small, some pretty massive. They are found throughout the warmer and wetter parts of Asia. Our largest species, Amorphophallus titanum, is found growing naturally in the rainforests of Sumatra, one of the many islands in the Indonesian archipelago. In 1878, one year before the Conservatory of Flowers opened, this plant was first encountered by Western botanists. Since then, this species has captured people’s imagination as the world’s largest unbranched inflorescence. Does it capture yours? Swing by and see for yourself! July 13, 2018: What better way to celebrate Friday the 13th than to delve into the stinkiest of the stinky plants: the Corpse Flower aka Amorphophallus titanum! Our gorgeous Corpse Flower, Suma the Titan, continues to grow in both height and circumference. Today’s 9:45 AM measurement is 44″ in height, a difference of 2″ since yesterday at 4:10 pm. As this bloom continues to develop, the plant is putting lots of energy and resources into one specific goal: reproduction. Flowers are all about exchanging genes and the Corpse Flower has developed two important characteristics that help it attract insect pollinators: a carrion-like odor and the ability to produce heat. Today let’s chat briefly on thermogenesis, the ability of a living organism to produce heat. For mammals like us, this is no big deal, it’s what we do. However, the ability to produce heat is unusual in the plant world. What researchers have discovered is that the Corpse Flower will begin to produce heat in the early evening and can heat up to 100.4 F by midnight. What’s the benefit of this heat production? To attract pollinators, who may come for the smell, but stay for the party (heat & comfort). In its natural habitat the Corpse Flower has been observed hosting multiple insect species that spend extra time in the bloom, resting up and hopefully pollinating the plant. Here are some photos taken this morning. Apologies for the poor light…it’s a foggy morning in San Francisco! July 11, 2018: Suma has given us enough cues to make a prediction! Given that the spadix and spathe have emerged, we are predicting that this bloom will open up next week. Be prepared for a certain someone (hmmm…Suma!) to get real stinky next week. We will host extended hours on the day Suma opens and blooms, and for several days after. Corpse Flowers typically begin opening in the late afternoon and the moment we see cues that action is about to take place, we will announce on our social media. How much has Suma grown? July 10, 2018: So much is happening! This lovely Corpse Flower is continuing to grow. First, the Conservatory of Flowers is thrilled to introduce the name of this plant: Suma the Titan. Suma means “born in the summer” in English and “flower” in Sanskrit. It also is a nod to the island this species is native to- Sumatra in the Indonesian archipelago. This inflorescence is now showing its characteristic spadix and spathe! These are the two primary structures that are visible with this bloom. The tall center piece is the spadix while the green scrunchy material surrounding it will open up as the spathe. July 6, 2018: Man alive this plant just keeps growing! Today’s height measures at 34.75″. At its widest point, this bud is now 21.25″ in circumference. We are getting excited here!! July 3, 2018: Happy day- we have a bloom! All indications are that the new growth on this plant will develop into an inflorescence! Today’s height measures at 31.25 inches. June 28 – July 1, 2018: Grew from 21.75 inches in height to 27 inches in height. What makes the titan arum so special? The titan arum is the largest unbranched inflorescence in the world – typically 6-8 feet tall. It emits a foul odor of rotting animal flesh, thus the common name of corpse flower. The plant also produces the largest leaf in the world reaching up to 20 feet high. Why does the bloom stink? The scent is a deception device that tricks pollinators into thinking the plant is rotting organic matter. These pollinators – carrion beetles and flies – lay eggs on decaying animals so their larva can feast when they hatch. The bloom heats up on the first evening to further disperse the odor. Is the bloom a flower? The titan arum is not the largest flower in the world – that title goes to the Rafflesia arnoldii. The titan arum is the largest unbranched inflorescence, which is a structure composed of many individual flowers. Hundreds of small flowers line the base of the spadix and are protected by a ruffled modified leaf called a spathe. Female flowers open a day before the male flowers, which is how the plant avoids self-pollination. Scarlet fruits develop from the pollinated female flowers. The fruits attract birds that eat them and disperse the seeds. What is the lifecycle of the titan arum? The seed grows into a small leaf with an underground corm, similar to a potato. After a year, the leaf dies back and the plant goes into dormancy for months. The plant goes through years of these dormancy and leaf cycles. Meanwhile, sugars made in the leaf are transported back to the corm, which continues to grow larger. Finally, 7-10 years later, the plant has stored enough energy to bloom. The inflorescence takes about a month to mature and is only open and pungent for two days before the spadix withers and collapses. Another bloom might occur in 3 or more years, until then the leaf and dormancy cycle continues. Usually, only one structure – either a leaf or a flower – emerges from a tuber during each cycle. Where is the titan arum native to? It grows on steep hillsides in the tropical rainforests of Sumatra, Indonesia. The Indonesian name for titan arum is bunga bangkai, which translates to “corpse flower” in English. Surround yourself with vibrant depictions of nature by the master of Impressionism in Monet: The Late Years, an exhibition that charts the ambitious final period of Claude Monet’s career.